The KM (KiloMetres ) Pass gives tourist complete control over their Australia journey and the opportunity to travel around as much as their hearts desire. Passes are completely flexible, can be used in any direction and are valid for 12 months. And as if it couldn’t be any easier, KM Passes can be topped up with additional kilometres. Excess KMs can even be used to purchase adventures, tours, experiences, and accommodation. This KM Pass entitles you to 1000 KMs worth of completely flexible hop on and off travel. This KM Pass entitles you to 2500 KMs worth of completely flexible hop on and off travel. This KM Pass entitles you to 5000 KMs worth of completely flexible hop on and off travel. These passes are perfect for those who have a certain destination in mind. The Hop On/Off Pass allows travellers to choose their journey and get on and off as much as they like in between. Passes are valid 6 months from the time of purchase and then 3 months once the journey has begun. Our Sydney ⇄ Cairns Hop On Hop Off pass let’s you experience both modern and traditional Australia. With access to city escapades and coastal beauties, you’ll encounter a combination of fast paced adventure and unwinding chill outs. There is so much to do along this beautiful coastline including; wine tours in the Hunter Valley, surf lessons in Byron Bay, 4 wheel driving on Fraser Island and sailing in the Whitsundays! 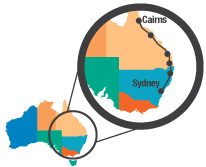 Did you know that it is 3150 kilometres from Sydney to Cairns? Australia is big! Remember, with our Hop On Hop Off passes, you can get on and off as many times as you like, as long as you continue to travel in one direction. Each pass is valid for 6 months from date of purchase and 3 months once travel commences, so you have loads of time to experience the beauty of Australia!